First, a batch of brownies that could very well be my favorite brownie recipe ever. Very sophisticated and complex, even those with issues against brownies will be awed by Dan’s take on it. Figs and chocolate are a great match, but add a little red wine and you’ll hit a jackpot. Make them. You must. 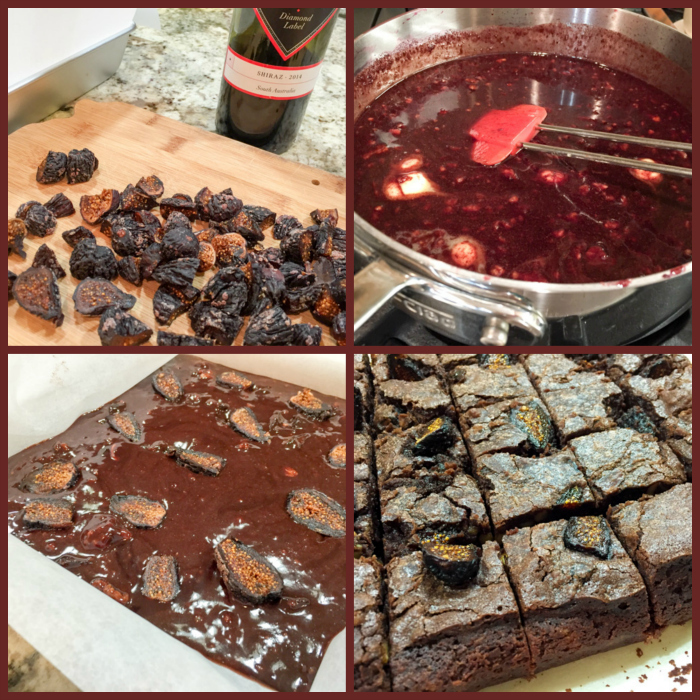 First you reduce Shiraz on the stove top until it is a concentrated purple-reddish beauty that smells wonderful… then you add to it chocolate, butter, walnut halves and dried figs. 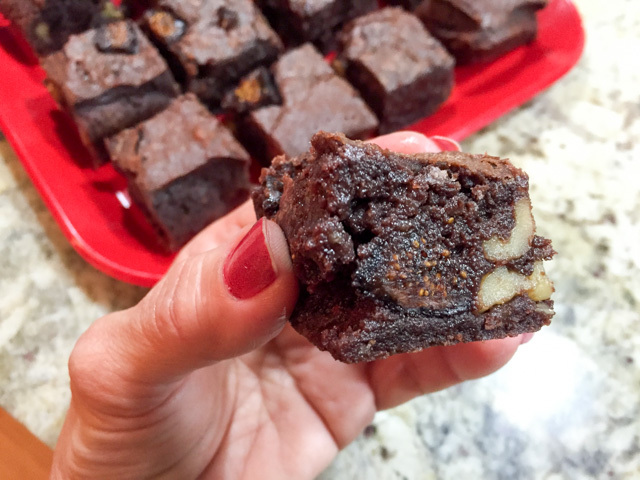 By the way, get the best quality figs you can find for these brownies. Also, make sure to keep the walnuts in large pieces, don’t go dicing them. The texture of the figs, the gooey chocolate and a slight touch of fennel seeds make this recipe shine! A real masterpiece in brownie format. Tell me, don’t you wish you could have a piece like RIGHT NOW? 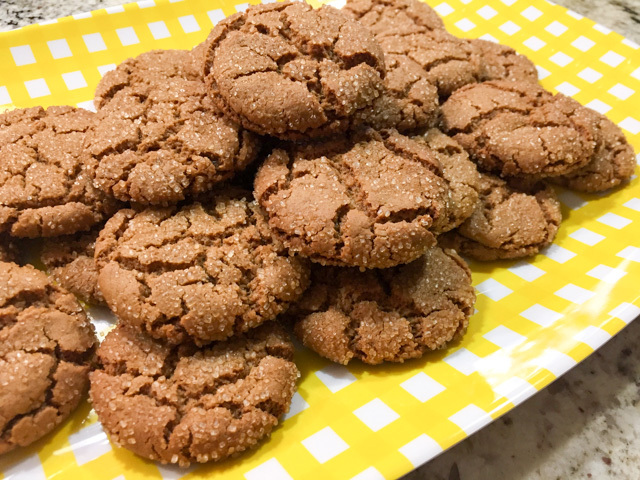 Next, let’s talk Chestnut Ginger Biscuits. 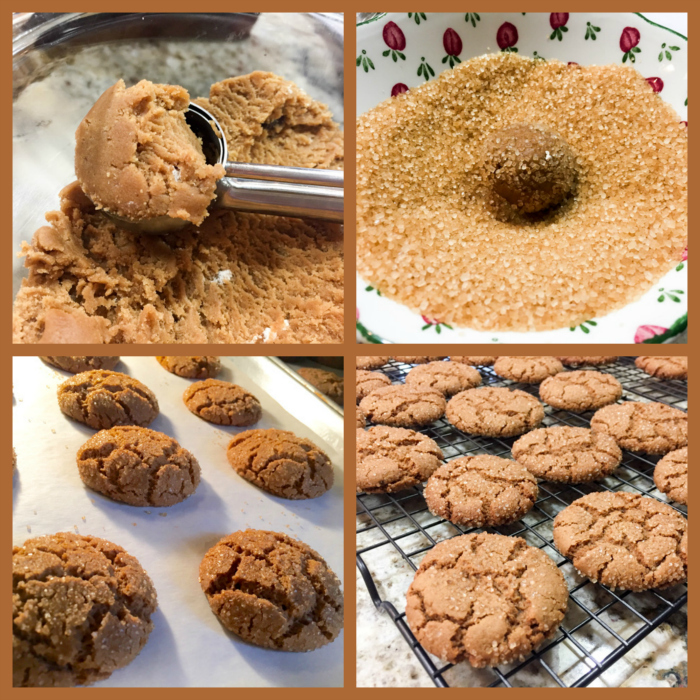 I adore ginger and anything sweet with spices, but normally have a bit of a problem with crispy cookies. I am definitely a soft-baked kind of girl. Sorry, odd phrase. Anyway, these cookies are basically dressed-up gingersnaps. They are crispy, they are hard, but once you bite into them, they melt in your mouth, and your senses are invaded with the warmth of ginger and cloves. Spectacular. Make them. You must. The recipe uses chestnut flour, an ingredient that might be a little tricky to find, but you can order it online. Smells amazing, actually. As usual for nut flours, keep it in the freezer. The preparation is actually quite simple, a one-bowl type of thing. Melt the butter, add the spices, get all happy with the intense smell as you mix the dough, that must sit in the fridge for a little while before scooping little balls and rolling in coarse sugar. They are fun to make, fun to watch as they bake and get all cracked, and fun to share with co-workers. On a side note, I baked mine for only 18 minutes instead of 25 as called for in the recipe, and they turned out perfect. As soon as they started to collapse a little, I removed them from the oven. Finally, let me share a special bread. It is not a Johnny Depp-like loaf. No, definitely not eye-candy. It is black, with a tight crumb, quite humble looking. But when you taste it, you realize you are in front of bread royalty. Believe it or not, I made it in December 2014 and never blogged about it, hoping to make it again and perhaps get better pictures. I have good intentions, but they don’t always materialize. Oh, well. Make this bread. You must. Very interesting preparation, rye flour is added to boiling water, then allowed to cool to lukewarm. Yeast and sugar are added. At that point, I realized I was out of an important ingredient to continue with the recipe (caraway seeds!) so I dashed to the grocery store, and returned to find quite a bit of a mess over my counter. On the positive side, at least I could be sure the yeast was alive and kicking. Or, should I say, bubbling? 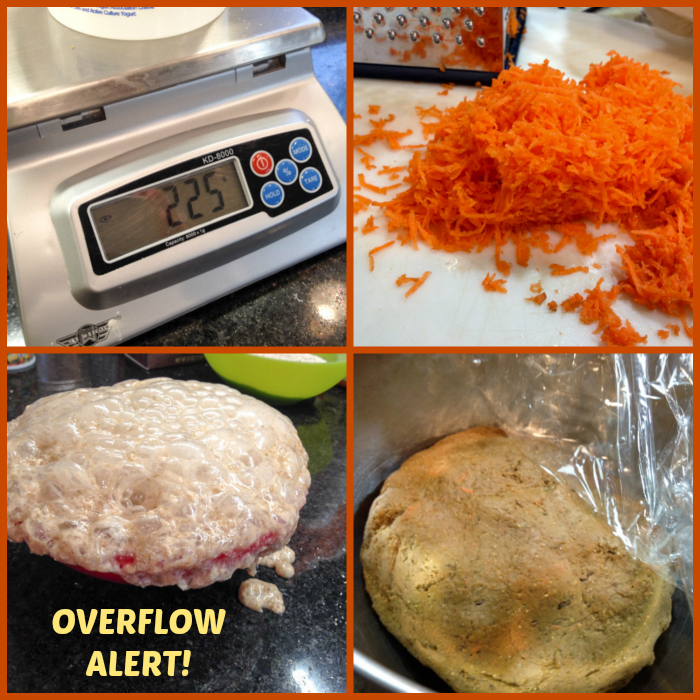 Another interesting twist in the recipe is the addition of grated carrots to the dough. All in all, a very straightforward bake, the bread will be ready in less than 3 hours start to finish. Bumper sticker from Penzey’s, a company I’ve been a customer for 15 years. They are taking a firm stance on a message of inclusion, of embracing diversity and refusing hate and division. On top of it, their spices rock! Visit and support their online store with a click here. An exciting trio. 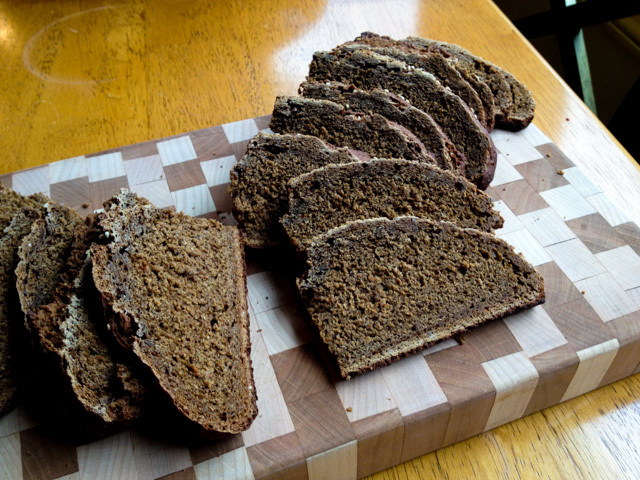 The black bread is particularly fascinating and I must make some. 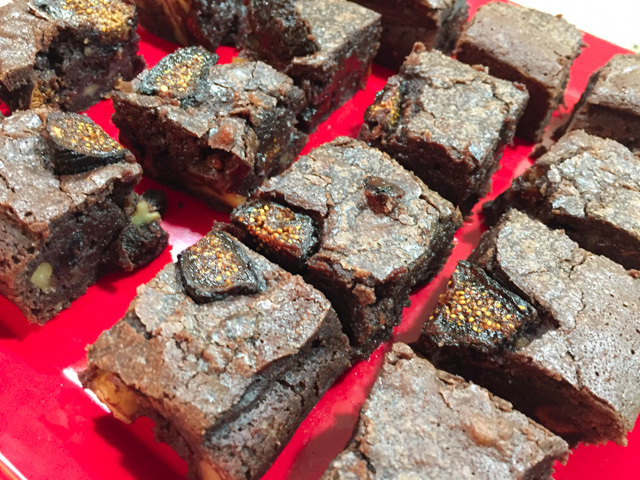 And oh those amazingly quirky brownies. I am SUCH a fan of Dan’s and any of his recipes are fun to make. my pleasure! Glad you enjoyed them! The black bread looks amazing! Does the carrot keep it moist? If you mean after a day or two, I would not know.. we gave the rest of the bread for our friends when they left to drive back to Oklahoma… 😉 But I bet it does. You could definitely tell it was more moist for a black bread than one would expect as biting into it. I should really make it again – so many recipes, so little time, but SO MUCH FUN ANYWAY! I love that you named your starter Dan, lol! Those gingerbread cookies are what I am eyeing, yum! A major pain to clean up…. good thing Bogey was not around at the time, he could have easily “taken care” of that part for me, but then there would be no yeast left for the bread!